I don’t even know where to start I’m just too excited about this series! I’ve heard so much about it from my bookfriend Bookmark That (Link to her review) and she was super excited about it too so I wanted to give it a go. I didn’t read about it on Goodreads or the synopsis when I received the book, I just started. I trust her opinions on books blindly now haha. The story is set in Cambridge UK, and I love a good novel from the UK as you all know. In the beginning, I was trying to figure it all out (probably because I was really curious and excited), like how does this match with that, what is this name doing there, you know like one normally does at the beginning of a book. I got a bit of HP vibes from it (which says a lot since I love HP! ), not like it’s copied or anything, but it feels like you are treading on familiar ground with new possibilities. 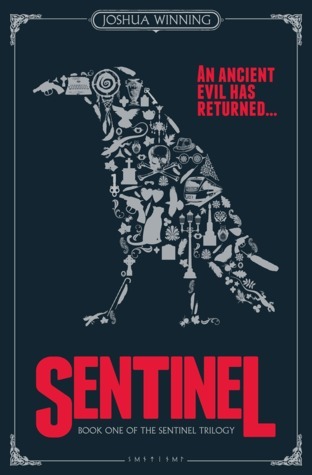 The Sentinel universe is a story of good and evil. There is magic, monsters, heroes living in secret, and murders which numbers are only increasing. Wherever Nicholas, the main character, turns, there seem to be more secrets, more lies, and more enemies. When we start this story we are just as much in the dark as Nicholas is, which is nice, because we kinda grow accustomed to a new world along with him. I think what I loved the most was the anticipation that I had when I started and that it kept on throughout the reading. The story changes perspectives which gives you a full perspective without giving away what is going to happen next. This keeps the anticipation very much alive and I love it! Nicholas annoys me from time to time though. My god, can a boy not listen to the more wiser sometimes?! Aiaiai, oh well, I like him for the most parts, and knowing myself he will probably really grow on me before I’m done with the trilogy, haha. I think my favorite character is Sam Wilkins. Sam knew Nicholas parents when they were alive and he used to tell Nicholas stories of heroes and monsters (camouflaged reality?) when he was young. Sam is a Sentinel and he has seen a lot in his days, and he steps up when Nicholas parents die to help out. I see him in my inner eye as an elderly man with trousers, a vest and a sharp shirt with his fedora on the top of his head and a twinkle in his eyes. He seems so selfless and brave, always ready to sacrifice himself for the good case in the world. I didn’t appreciate all the treatment he got in the first book, but I hope it doesn’t get worse further on in the series! Another character that I find amusing is Isabel. She enters the story under strange circumstances which turns out to be rather amusing in the end. She reminds me a little bit of Minerva McGonagal, which only makes the whole thing even better. I can’t say too much about her though, because that would spoil too much fun. This story really sucked me in and I was lost in it as long as I read the book. I haven’t been this absorbed in a series since 2016 when I read the All Souls Trilogy by Deborah Harkness. The description of the monsters and the magic that unravels is so thorough and well formulated and so is the description of the characters! The whole storyline is well composed and balanced between excitement and description, and between evil and good. It made for such an enjoyable read! I really recommend it to everyone who enjoys fantasy books and it is good for both young adults and grown-ups. A tip from me is to order all the books at once because I can guarantee you that you don’t want to have to wait for the rest to arrive in the mail!